There are moments in this journey that take your breath away. 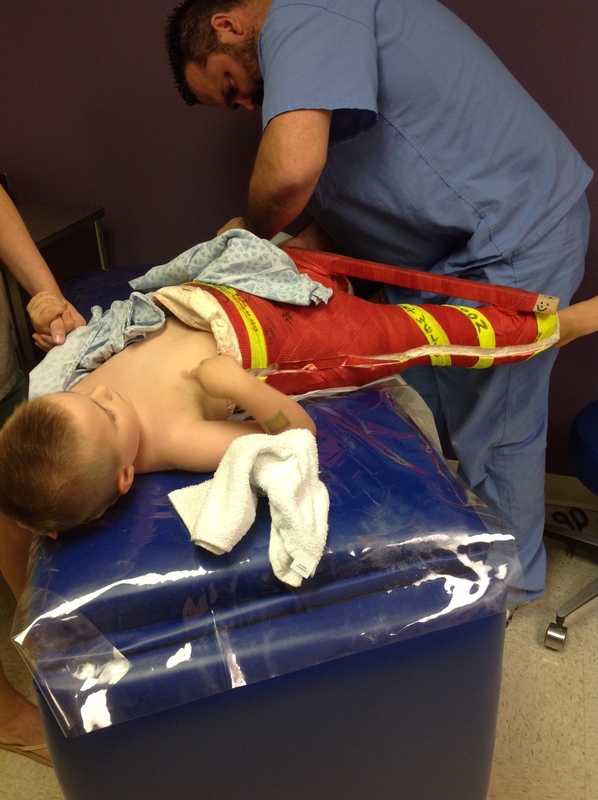 After being a bit nervous while his cast was being removed, there were moments of anticipation and excitement as he got to see his body (since the good majority of it has been covered… with his tough guy body armor) for the first time. He looked down and felt around but was unsure if he could move. 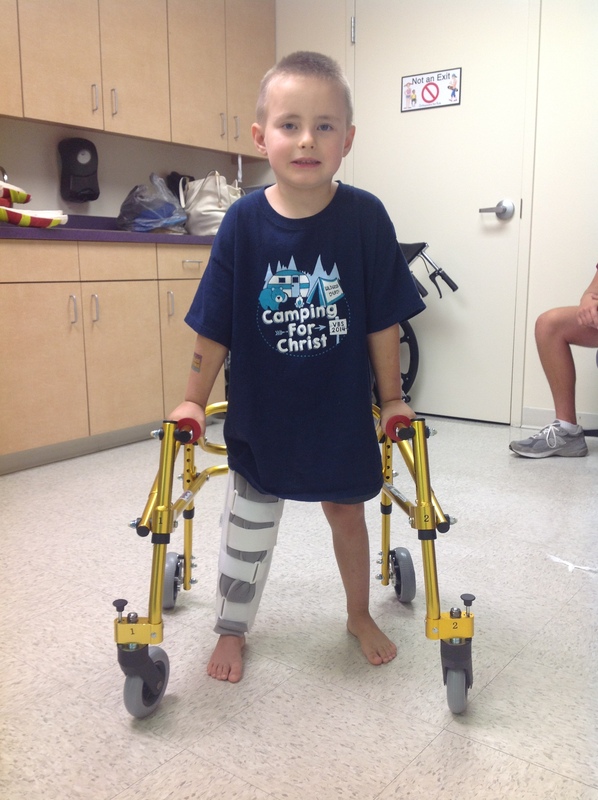 After a quick scrub down, he able to put regular clothes on for the first time and was then fitted with his immobilizer brace. With his new pediatric walker in place, Cole hugged my neck while I had the honor of lifting him up vertically and putting him on his feet for the first time since his surgery. He was a bit timid at first but stood their like a champ. The wave of emotion to see my little guy standing their took my breath away. Dr. Killian had him simply stand and practice lifting his legs independently. He also had to move his legs closer together (as they’ve been used to being spread at a fairly wide angle for over a month). But Cole was ready to move. Somewhat like a pirate, he started to walk with his walker. I really couldn’t believe it. No pain. No real struggle. Just a slow walk towards the door. So much of this journey has awakened spiritual realities in all of our lives through Cole’s story. Watching him become free from the cast and starting to move again turned my thoughts to what it is like to move from death to life. 2 Corinthians 5:17 says, “Therefore, if anyone is in Christ, he is a new creation. The old has passed away; behold, the new has come.” Cole was experiencing the “new”. And just like the slow steps he took to get going, so are the steps we take as we learn to die to ourselves and walk toward and with Christ. We keep returning to God’s faithfulness as a theme of our journey. I think we have really started to see it more and more the way we are supposed to live… simply trusting in faith by putting one foot in front of the other, all the while knowing that our Savior is right there with us – supporting us, sustaining us and cheering us on. Cole’s confidence and movement has progressed nicely in the first 24 hours. In fact, I think our harder struggle will be slowing him down some enough to rest and take it easy. He has already started physical therapy and that will continue for a few more months. Wow! This is fantastic seeing these photos of Cole without the cast! Our God IS an awesome God! Prayers continue for Cole every day, knowing His Great Physician is surely doing a mighty work in him.